Our product range includes a wide range of provironum tablets, thyroxine sodium tablets, dydrogesterone tablet, progesterone capsules, natural progesterone injection and levothyroxine sodium t3. 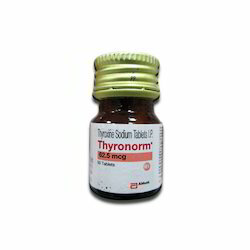 Offered by us is a prime range of Thyroxine Sodium Tablets that is prescribed as a treatment for an underactive thyroid. Offered range helps in balancing the hormones that the thyroid gland which normally produce reinstating balance in the system. Apart from this, these tablets can be availed by our valued client’s at most reasonable prices. 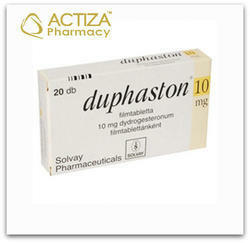 Actiza Pharmaceutical is a trusted name in the market that engages in proffering Dydrogesterone Tablet that are extremely popular in the market. Processed in compliance with the existing industry standards at our vendors’ location, these effective tablets are widely demanded among our valued customers. 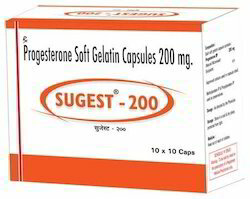 We are reckoned manufacturer & supplier of wide gamut of Progesterone Capsules. These progesterone capsules are formulated at our working place under the keen observation of experienced professionals along with the international quality standards. The offered capsules are obtainable in diverse packaging options to fulfill the needs of the customers spanning across the country. 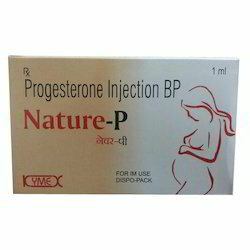 By the assistance of our skilled team of professionals, we are engaged in offering Natural Progesterone Injection that is used in the treatment of infertility; the given range of progesterone injection is made by using best grade of ingredients in proper amount. 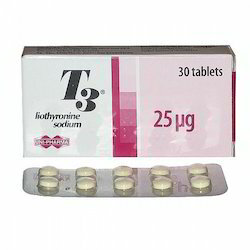 Backed by a team of qualified professionals, we are actively engrossed in providing a quality proven assortment of Levothyroxine Sodium T3 in the market. These products are composed using tetraiodothyronine sodium or triiodothyronine sodium. In addition to this, these ingredients produced in the human thyroid gland by the coupling of the amino acid tyrosine. Adrenaline Injection is used for emergency treatment of severe allergic reactions (including anaphylaxis) to insect bites or stings, medicines, foods, or other substances. It is also used to treat anaphylaxis caused by unknown substances or triggered by exercise. 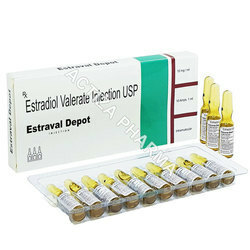 Estradiol valerate 10mg, a long-acting estrogen preparation for use by injection, to replace the loss of estrogen at menopause, relieving menopausal symptoms. 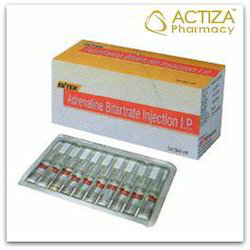 Estradiol valerate general informationWhat is Estradiol valerate used for?Estradiol valerate 10mg vials are a hormone replacement therapy (HRT) used to substitute for the lack of oestrogen production by the ovaries that happens during menopause or following surgical removal of the ovaries, to relieve moderate to severe symptoms of menopause caused by oestrogen deficiency, such as hot flushes, night sweats, sleeplessness, vaginal dryness, headaches, mood swings, lack of concentration and loss of energy. Progynon Depot is also are also used to help prevent postmenopausal bone loss (osteoporosis) and reduce risk of fracture. Progynon Depot is used to relieve the symptoms of advanced androgen-dependent carcinoma prostate cancer. Oestrogen stimulates the development of female characteristics, and Progynon Depot is used as part of a transgender hormone therapy for male to female . 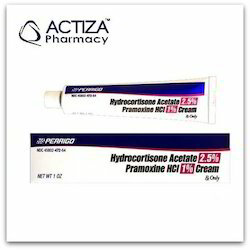 Hydrocortisone Acetate Cream is used to treat a variety of skin conditions (e.g., eczema, dermatitis, allergies, rash). Hydrocortisone acetate reduces the swelling, itching, and redness that can occur in these types of conditions. Cream is Anti-itch cream helpful in relieving itching & Redness fast. Progynon Depot 10mg vials contain oestradiol valerate 10mg, a long-acting estrogen preparation for use by injection, to replace the loss of estrogen at menopause, relieving menopausal symptoms. Progynon Depot general informationWhat is Progynon Depot used for?Progynon Depot 10mg vials are a hormone replacement therapy (HRT) used to substitute for the lack of oestrogen production by the ovaries that happens during menopause or following surgical removal of the ovaries, to relieve moderate to severe symptoms of menopause caused by oestrogen deficiency, such as hot flushes, night sweats, sleeplessness, vaginal dryness, headaches, mood swings, lack of concentration and loss of energy. Progynon Depot is also are also used to help prevent postmenopausal bone loss (osteoporosis) and reduce risk of fracture. 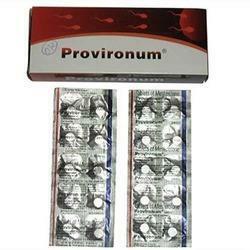 Progynon Depot is used to relieve the symptoms of advanced androgen-dependent carcinoma prostate cancer. 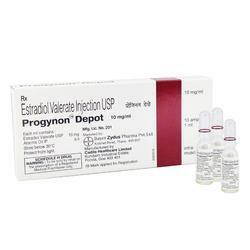 Oestrogen stimulates the development of female characteristics, and Progynon Depot is used as part of a transgender hormone therapy for male to female .How does Progynon Depot work?Progynon Depot 10mg vials contain oestradiol valerate, a synthetic form of naturally occurring oestradiol, which is the major and most active form of the female hormone oestrogen, and is biologically similar to the natural hormone. Each vial contains 10mg oestradiol valerate in a sterile oil solution, which is a long-acting estrogen preparation for intramuscular use by injection. Oestrogen is a steroid hormone produced by the ovaries that binds to specific receptors inside oestrogen-responsive cells and stimulates them to make proteins involved in producing secondary characteristics, such as breast development and in regulating the menstrual cycle. Oestrogen also has several other actions in various metabolic processes including maintaining bone mass and lipid (fat) metabolism. What does Progynon Depot contain?Progynon Depot 10 mg vials contain the active ingredient oestradiol valerate, a synthetic form of naturally occurring oestradiol, which is the major and most active form of the female hormone oestrogen and is responsible for the development of female characteristics and regulation of the menstrual cycle. Each vial also contains a 1ml vehicle being Peanut oil (Arachis Oil)@Treating symptoms of menopause with Progynon Depot. Progynon Depot 10mg injections contain oestradiol valerate a long-acting estrogen, used to treat symptoms of menopause caused by a lack of endogenous oestrogen(produced by the ovaries), such as hot flushes, night sweats, sleeplessness, vaginal dryness, headaches, mood swings, lack of concentration and loss of energy. Progynon Depot for hormone replacement therapy (HRT)Progynon Depot 10mg injections contain the active ingredient oestradiol valerate, a synthetic form of naturally occurring oestradiol, which is the major and most active form of the female hormone oestrogen and is responsible for the development of female characteristics and regulation of the menstrual cycle. Progynon Depot 10mg injections are used for hormone replacement therapy (HRT) and substitute for the loss of oestrogen production by the ovaries that occurs during menopause or following surgical removal of the ovaries.